The KnowEm API – Yes, it’s here. By popular demand we have built an API to perform username searches for our partners. This API will give you the ability to search KnowEm’s database of over 500 social networks for username availability (coming soon: Domain and Trademark Search APIs). If you are interested in learning more please let us know by scheduling a call using our Contact Form. Not only do we have a username search API, but we also have a full e-commerce API which lets you place new orders and retrieve information on all your orders with KnowEm. Now you can easily integrate the KnowEm suite of products and tools right into your existing site or dashboard. Social Media Brand, Product, Trademark or Username profile registration and protection on over 500 social networks. Brand/Trademark infringement Takedown information and assistance for every social network in our database. Social Media monitoring for the use (or misuse) of your Brand, Product, Trademark or Username. Domain registration to protect your brand from cybersquatting on over 100 TLDs and extensions. 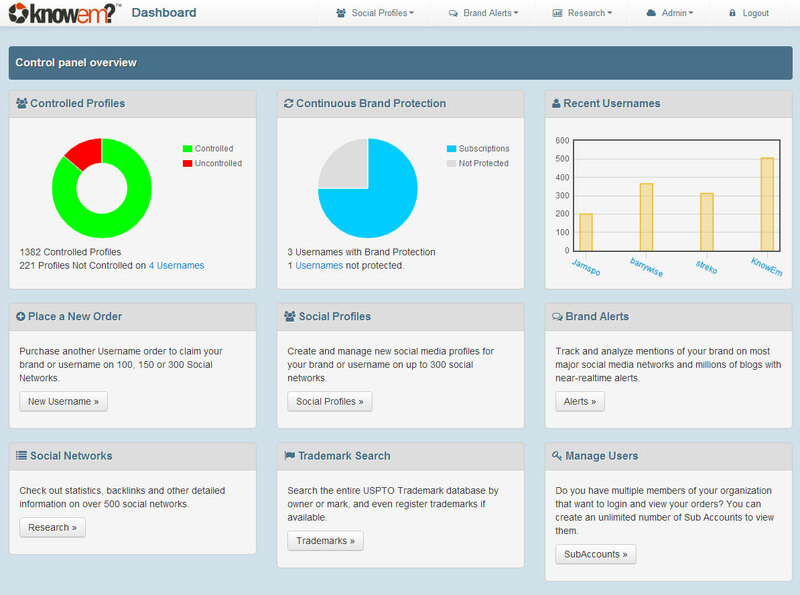 Your own version of our dashboard will include full administrative control over everything, providing you with the ability to create new customer accounts, allowing your customers to place and review orders on their own, and to assign managers within your organization for each customer – basically everything you need as a turn key solution for complete Social Media brand management and protection. If you’re interested in checking out any of these great new features or have any questions about our services, please don’t hesitate to contact us today and we would be happy to schedule an online Webex demonstration for you and your team!